Clay Helton led USC to a bowl win and will stay on board as Steve Sarkisian's offensive coordinator. That was an oddly fun USC season, wasn’t it? If the Trojans end 2014 at the Las Vegas Bowl, things won’t be so merry, but this year is a little different. From a bungled fall camp quarterback competition to scoring seven points at home against Washington State to Lane Kiffin’s wee-hour firing to Ed Orgeron to beating Stanford to KEEP COACH O! to losing to UCLA to Sark’s return to Coach O’s departure to a Las Vegas whipping of No. 20 Fresno State, 2013 was a hell of a story arc. You could understand if the Trojans were legitimately happy to be playing in Las Vegas on the first Saturday of bowl season, because they had a worthy opponent in the Bulldogs, a chance to earn a 10th win and a cool city to hang out in for a week. Were they as happy as Dion Bailey is here? Before we turn out the lights on USC’s season, let’s look at a few things from its 45-20 Las Vegas Bowl win. 1. Is this it for Marqise Lee as a Trojan? Lee is a projected first-round pick in the upcoming NFL Draft and could go as high at the top 10, and so it’s time for him to go. He’s already gotten lucky in a way. Lee sprained his left knee at in late September Arizona State — it seemed worse than that at the time — and aggravated it in the first half against Notre Dame three weeks later. Every week brought about new wonders of whether Lee should even be testing the asset that’s so valuable to his future. Alas, Lee made it out of this season relatively healthy, even catching seven balls for 118 yards and two TDs against Fresno State. If that was Lee’s last game at USC, it capped a good run. Kessler went 22 of 31 for 344 yards and four touchdowns (one interception) against Fresno State, connecting on a bevy of impressive throws with a few bad misses mixed in. His four TDs were also a career high. It was enough to make the anticipated quarterback battle next August between Kessler and redshirt freshman Max Browne — I suppose we should include Max Wittek, too, unless he transfers — pretty interesting. Everyone around USC and college football raves about Browne and wants to see what Steve Sarkisian will do with him. But this Vegas Bowl performance from Kessler felt like a preemptive strike in next summer’s QB1 competition. Earlier this fall, offensive coordinator and bowl-game head coach Clay Helton mentioned the growth Kessler was making, how he was maturing in his role in the offense and managing situations better. 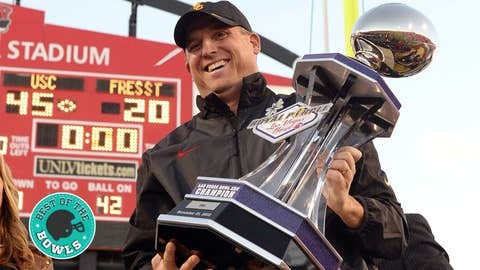 After the game, it was announced Helton will be retained as the full-time offensive coordinator on Sarkisian’s staff. What can USC fans look forward to with Helton next fall? I think a little more tempo, to start. Helton comes from a no-huddle spread system at Memphis, and while USC will never be that, the Trojans will probably roll a bit more next fall. In our conversation last month, Helton said he’d like to add some more tempo to USC’s system but couldn’t this season because the team was already entrenched in a playbook and wholesale changes in the middle of a season don’t tend to work. “You have to do what’s for the betterment of the team, and they knew the system that was in place,” Helton said. I’d guess the Trojans will be a bit more liberal in picking their spots to press the pedal next season while still leaning heavily on Buck Allen and others in the run game. Should be a fun balance to watch. Taking a USC timeout to mention Fresno State quarterback Derek Carr, who played his final game as a Bulldog and will head to the NFL. He made those quirky, late-night kickoff times fun, and Fresno State’s Friday night win over Boise State in September was one of those great, intimate games that only the college football diehards (or those without Friday night plans) share together. Saturday against USC wasn’t Carr’s best game — 29 of 54, 217 yards, two TDs, one INT — and there are already posts on the Internet dissecting what it means for his draft stock. But Carr will have a few more chances to juice his stock before May’s draft. He has the Senior Bowl in Mobile, Ala., the NFL combine and his Fresno State pro day. With good showings at those events, he has a chance to get into the first round. More importantly, this gives us a chance to replay this Carr feature FOX Sports did earlier this year, which is heartwarming and perfect for this time of year. All the best to the Carr family. After the season they’ve had, it’s only fitting to give the players the last word. That win was for Coach O and the seniors who lead by example!! USC and the City of Los Angeles y'all treated me amazingly time to get back to my son and grind to keep some food in his mouth! #FightOn ! !